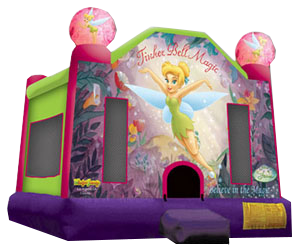 This Tinker Bell bounce house will bring the essence of Disney, with a little pixie dust, to your next party. On this bounce house, the gorgeous artwork depicts Tinker Bell spreading some enchantment throughout her flower-filled pixie land and urging everyone to believe in the magic! Kids will certainly become believers as they jump to their hearts content with the fluttering branding icon of Disney on this bounce house.